The itinerary for this trip: Backpacking 2 nights, approximately 21 miles. Shoestring Adventures offers guided weekend camping and backpacking trips across California, as well as group hikes on local trails. 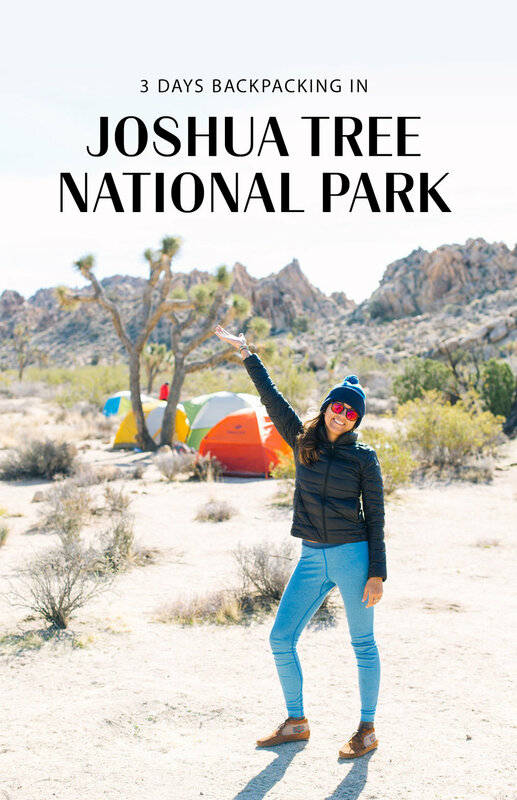 I did a backpacking weekend with them last August to Yosemite National Park and loved it, so I decided to jump on board for a second all women's backpacking trip to Joshua Tree National Park. I love these trips so much because it eliminates the stress of planning routes and camp meals, Shoestring does that all for you. They also bring along a "tripographer" to capture amazing photos so you can stay in the moment. We met at the trail at 8am to do a brief packing tutorial. The ABC's of packing are Access, Balance, and Compression. 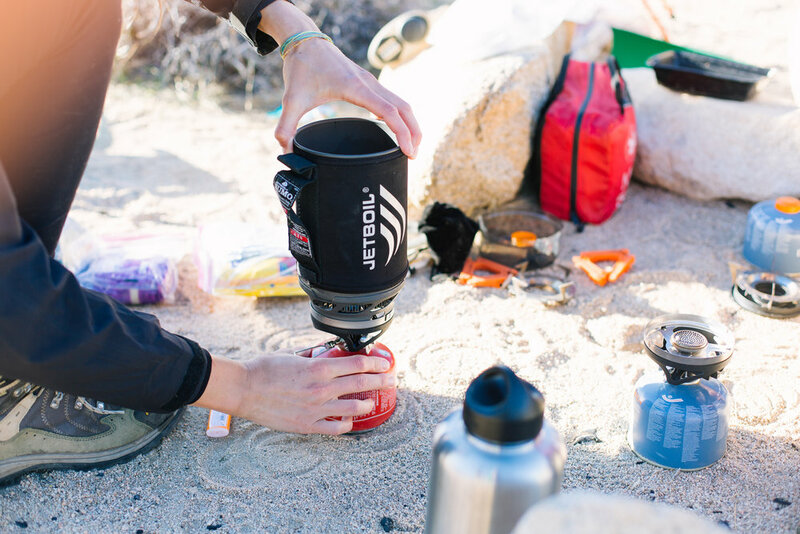 Access: Make sure things that you need on the trails are easily accessible like water, snacks, and sunscreen. Things that you won't need until you make camp you can pack on the bottom. This way if you stop to apply chapstick or eat a protein bar, you won't have to unpack your whole bag to get it from the bottom. Balance: Pack your bags in a balanced way with heavier items on the bottom and weight distributed evenly within the backpack so you're comfortable while hiking. You don't want to have a heavier load offsetting your balance. Compression: Compress down as many things as possible to save space and so things don't move around inside your backpack. Get rid of unnecessary wrapping, and transfer bulky items to more streamlined ones like ziplock bags (think food). Since Joshua Tree doesn't have any fresh water sources like rivers or lakes we had to drive and hide some water on another trail before beginning our trip. Make sure you have enough water for drinking, cooking, and washing. We each started out with 6L and hid another gallon of water per person for our 3-day trek. We started our trip at Indian Cove for a few miles of flat desert terrain. It was sunny and warm, hardly any wind as we hiked onward, getting used to our heavy packs. Most the ladies on this trip are new to backpacking. It's always a bit of a shock carrying your sleeping bag, pad, tent, water, food, and layers on your back. 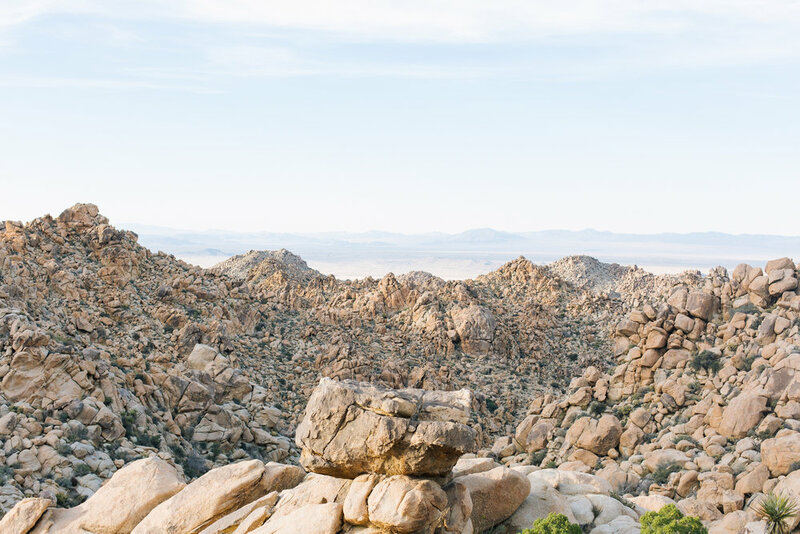 We started to climb at about mile 3, up into the large stacked boulders of the Joshua Tree mountains. A short 4 miles in we found a nice flat spot among the mountains to make camp for the first night. We made delicious camp pizzas out of tortillas, sauce packets, and cheese. For dessert (in the desert) we cooked up some blueberries and granola to make our very own camp strudel. You could say our trip leader Alyx is an outdoor Michelin chef. As we sat around the camp stove we got to know each other better. That's one of the beauty's of the backcountry, you are forced to leave behind cell service and wifi and just live in the moment with either complete silence or an uninterrupted conversation. That night was cold, and as much as I love the outdoors it was a rough one. The wind on the tent made strange sounds that kept me awake, and I had to get up twice to head outside to use the "facilities." That being said, leaving the tent at night when all the lights were out meant the sky was completely lit up with stars, and it was majestic to look up at. In the morning we continued on to the next camp 3 miles away, and also where we dropped our water the day before. By the time we reached the junction where Big Pine meets Willow Hole, the wind had picked up and there was a cold chill in the air. We set up camp before heading out on a hike, and it was difficult to pitch a tent in the heavy wind because it acts as a kite. Also, we were slightly nervous that when we returned from the hike our tents might not be there, so we weighted them down with gear and water jugs. After all was secure, we grabbed our day packs (that now felt like feathers), and hiked Willow Hole trail 2 miles to the Wonderland of Rocks. Willow Hole Trail is a flat trail down a river wash, and through a canyon of boulders. Once completely through the canyon you end up in a large sandy open space surrounded by stacked boulders all around. It was breathtaking. We relaxed for a bit, then headed back to camp for the evening. By the time we returned the weather had taken a turn for the worse. 35 mile an hours winds and C.O.L.D. We decided to make dinner ASAP so we could retreat to our tents early. On the menu that night was burritos. Dehydrated beans, rice, avocado, dried onions, and tabasco sauce. Yum! For dessert, we had apples dipped in melted chocolate. It was a delicious meal but one spent shivering under the night sky. Found myself a nice little seat. The powerful wind shook our tents. We were in the great wide open without the shield of rock or mountain in sight. Couple that with temperatures in the mid to low 30's and you get a restless and cold night. Even with ear plugs in, I tossed and turned and shivered though the night because of the tent flapping angrily. We woke up early in the morning to try and leave camp by 8am, but that meant breakfast in even colder temps than dinner, then packing up as our fingers fought to gain movement. We managed to pack up, but just as we did, something crazy happened, it began to snow! This is something I least expected. Sure the temps dropped into the 30's, but I checked the weather several times before our trip and there was no snow, and no rain. When backpacking, it's always a good idea to bring layers for cases like this, and luckily, we all had. 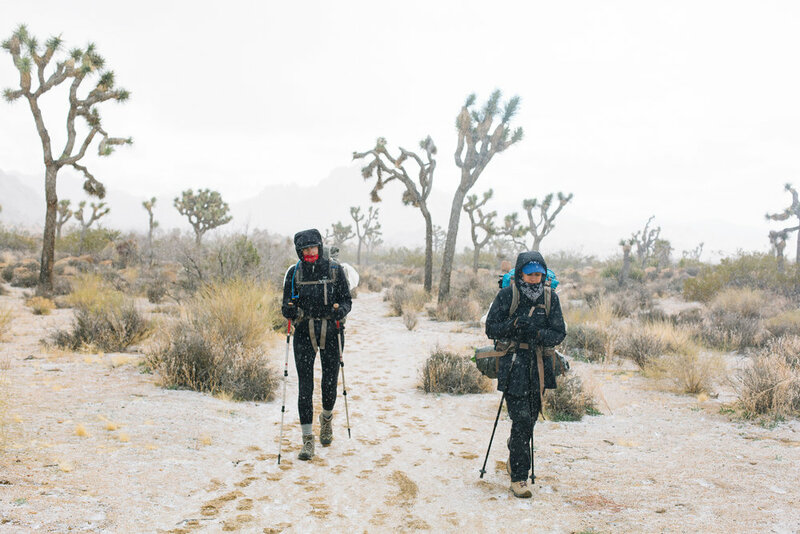 As we started our last hike of the weekend, the snow hit our faces and fell to the ground, blanketing the sand and cacti with a white softness. To me, it was the most beautiful thing. It was so unexpected, and such a unique experience, which is the main reason why I enjoy getting out into nature and backpacking every now and then. We basked in the moment, laughing at the strange scenario on our last hike out. 3 miles through the snow we reached clear skies. We had 4 miles to go until the end of our journey. It was sunny, but windy and we quickened our pace, ready for a comfortable seat and a hot meal. We ended the hike feeling accomplished, and stronger than the week before. We got into our warm cars, and drove to eat victory burgers at Joshua Tree Saloon. It was the end of a great adventure. That's me on the right, looking like a gangsta.